On War is one of the first books on modern military strategy. Writing mostly after the Napoleonic wars, between 1816 and 1830, von Clausewitz never lived to see it published. He had a theory that it was the integration of political, societal and economic issues that was the most important factor in deciding the outcome of a war. This new theory made On War one of the most important texts on strategy ever written. 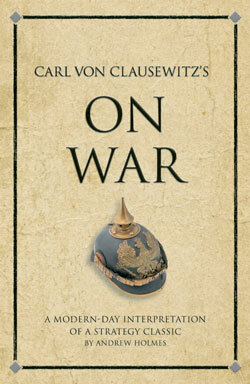 Here, Andrew Holmes’ interpretation of On War illustrates the timeless nature of von Clausewitz’s insights by bringing them to life through 52 modern case studies of business and society. This brilliant interpretation of On War is an entertaining accompaniment to one of the most famous strategy books ever written.